Social Studies: Unit 4. Indigenous People - Mr. Scheel's Website! Indigenous People-Called Tribal Peoples, First Peoples, Native Peoples, Indigenous Peoples constitute about 5% of the world’s population, yet account for about 15% of the world’s poor. ​There are approximately 370 million Indigenous people in the world, belonging to 5,000 different groups, in 90 countries worldwide. Indigenous people live in every region of the world. Using artifacts and personal stories to better understand the lifestyle, religion or customs of a people. A.8.11 - Students will give examples of the causes and consequences of current global issues and suggest possible responses by various individuals, groups and nations. E.8.14 - Students will describe cooperation and interdependence among individuals, groups and nations. E.8.10 - Students will explain how language, art, music, beliefs and other components of culture can further global understanding or cause misunderstanding. E.8.13 - Students will select examples of artistic expression from several different cultures for the purpose of comparing and contrasting beliefs expressed. Students can identify a primary source document. Students can write to inform using evidence to support their opinions. ​With your partner, complete all 5 activities below. You can turn in one packet per partner pair, but make sure BOTH partners are doing the work! How many people exist in the world today? How many languages are currently used in the world? Research and find out the REAL answers to the questions above and then some more interesting facts! Numbers are constantly changing...so give your best estimate! So...exactly how big is billions of people? Use the National Geographic glossary resource (see below) or others to define the terms - you might have to look at individual words and then create your own definition. ​Watch the video below to understand why it is important to help Indigenous Peoples save their cultures. With over 370 million indigenous people (over 5,000 groups) spread out among 70 different countries, learning about indigenous people can be a bit overwhelming. Not only are their population numbers constantly changing, but, also the places where they live differ and change. Indigenous people live all over the globe, from rainforests to the deserts, high in the mountains to along the river valleys, and in the Artic to deep in the outback of Australia. 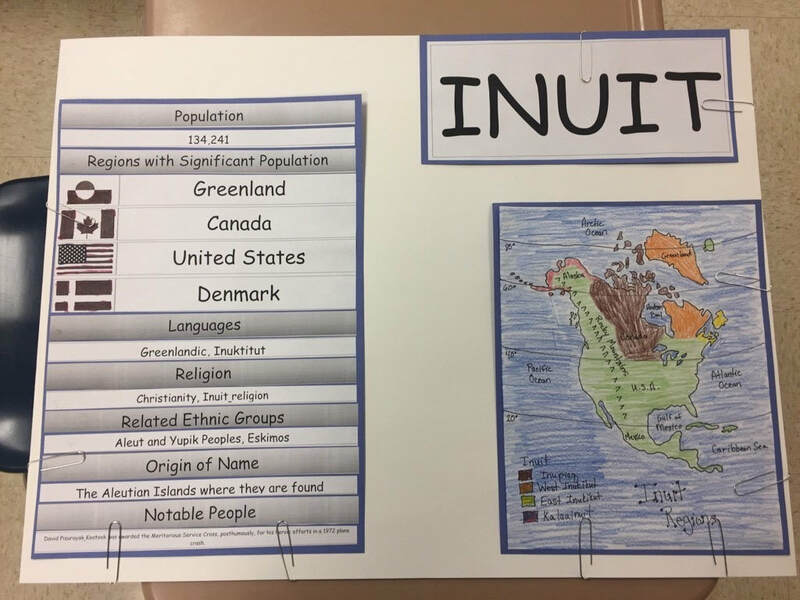 The next activity will have you and your partner breakdown the list and organize some of the indigenous groups into a map of their native land to gain a better understanding of the location of where indigenous people live. ​Using the resources below, with your partner, you will be responsible for locating a list of Indigenous Peoples in a particular area you are assigned. Who will be your 'MAN'? Which group of people do you think NEED to be heard? Which Indigenous Peoples story, culture, and life will you share? Who will you select? Create a group of 4 people (from the same region). Today you will be participating in a draft to pick the indigenous tribe your group will be studying for the next several weeks. Come up with a list of your top 5 prospects (groups). Your group will pick a playing card and the draft picking order will be determined by the card your group picks. If your 1st pick is gone you will try for your 2nd pick. Over the next few days, you will be working on the basic information about your Indigenous Peoples Group. You will be displaying the information you learn about your tribe on a tri-fold display board. 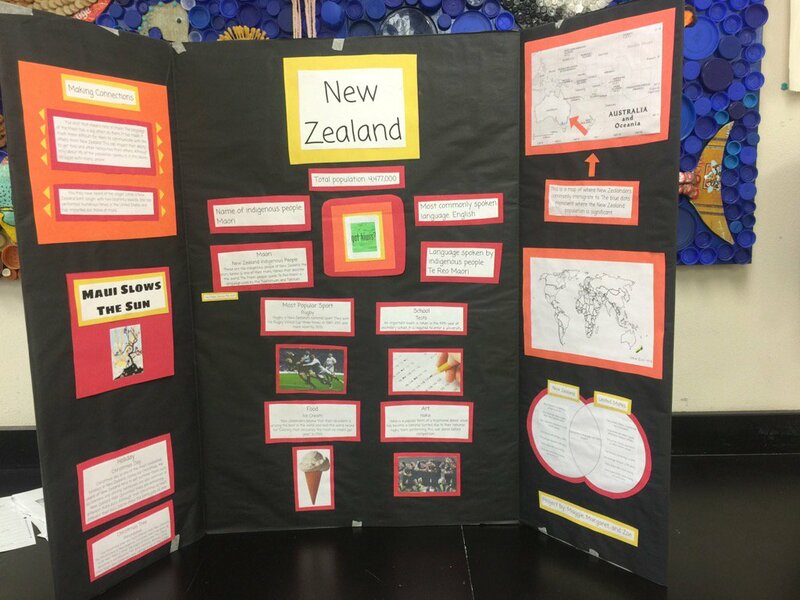 (see example below) This part of the display board will provide your audience with the name of your group, origin of the name, population, and regions inhabited, languages, religion, a visual, notable members, and other related ethnic groups. In order to complete this, you will need to complete the following steps! 1. Research your indigenous peoples group and fill in the organizer with the correct information for your tribe. 2. Complete the rough draft of the map of your tribes inhabited countries. ​In part 2 you will be creating the text boxes with information on your tribe. YOU MUST USE THE TEMPLATES provided below for this information. These boxes will be cut out neatly and matted on the same color construction paper throughout the project. These pieces of information will be displayed on your tri-fold display for the Indigenous Peoples Fair. They must look professional. When complete, this basic information section should have 3 different items that will eventually go on your tri-fold display. The three items should look like the picture below. *At the bottom of the subtitle information template there is a space for flags. The flags you copy and paste in should be of the current countries your tribe resides in. Once printed off in black and white you must color the flags with colored pencil. See example. Your tribe may reside in many countries or only one. Political and physical features that the area is know for. When final map is approved by your steam teacher you should carefully mat the map on construction paper. Culture ~ What is it? Understanding, appreciating, and respecting the culture of your people is very important to your immersion in their society. You can't truly see through the eyes of the people until you understand their culture. We will watch the following videos on Culture! Some of these might be hard to find - READ, READ, READ! Each partner will need to research 2 of the 8 topic areas. To be included with your presentation, you must in color code your group and where they are from and include a symbol of that area. Use the document below to find out your group's color and symbol.